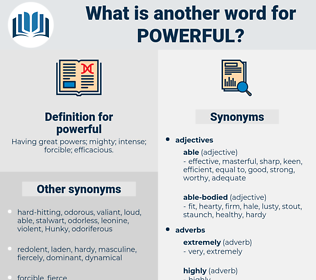 What is another word for powerful? influential, high-powered, compelling, forceful, potent. wonderful, eloquent, impressive, loud, louder, convincing, persuasive, massive, important, well-performing, resolute, sharp, serious, incisive, profound, evocative, authoritative, powerfui, high-power, well-functioning, meaningful, big-time, prominent, useful, vibrant, emphatic, excellent, efficacious, overwhelming, well-established, resounding, remarkable, aggressive, stark, terrific, clear, fearsome, immense, dramatic, large-capacity, impactful, far-reaching, crucial, weighty, pervasive, bold, preponderant, high-capacity, vast, favourable, helpful, well-positioned, spectacular. 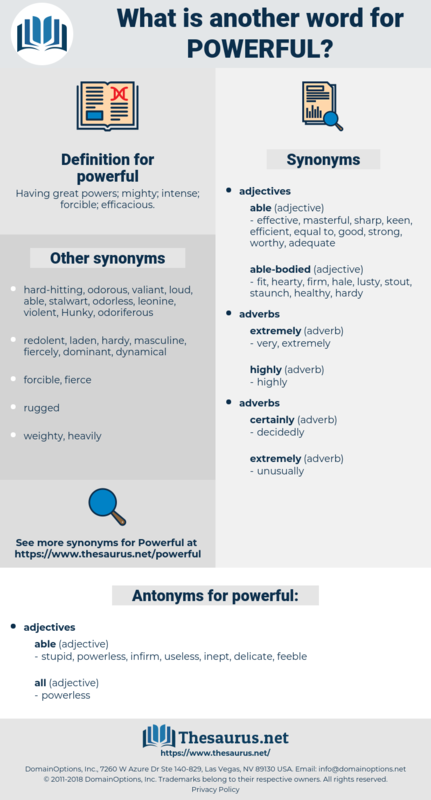 strongest, vigorous, formidable, energetic, intense, enormous, tremendous, hard-hitting, considerable, dynamic, strong, decisive, valuable, staunch, robust, deep, drastic. stupid, powerless, infirm, useless, inept, delicate, feeble. impotent, lethargic, unable, idle, inactive, ineffectual, weak, unimportant. helpless, unskillful, little, insignificant, subhuman, uninfluential, inexpert, unknown, obscure, nameless, unfit, uncelebrated, unskilled, unqualified, incapable, incompetent, anonymous, ineffective, flimsy. I never yet saw brother possessed of so evident and powerful an influence with a sister. It couldn't possibly be that powerful, could it?